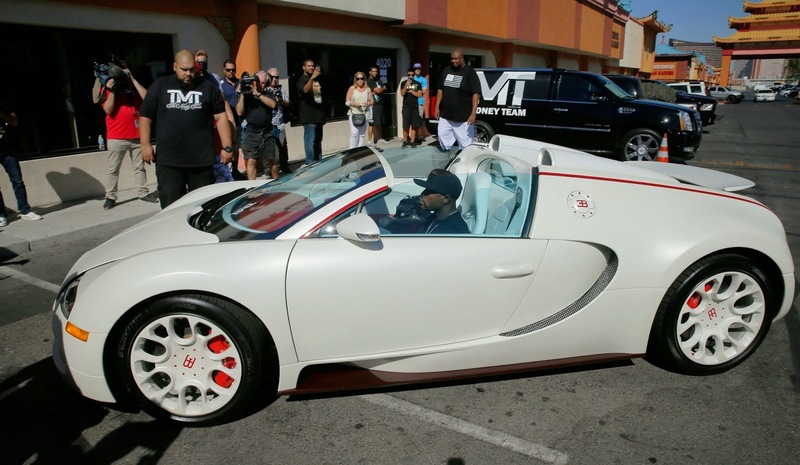 LAS VEGAS – Floyd Mayweather Jr. lives a life of unimaginable luxury thanks to his boxing success. He has multiple mansions, a fleet of expensive cars, his own airplane and a line of people waiting to serve him. He received a training camp visit the other day from Warren Buffett, whose net worth of more than $66 billion makes even Mayweather look like a pauper by comparison. Be certain that Buffett doesn't make a habit of stopping by hot, sweaty boxing gyms on a regular basis to check on the progress of other fighters. "Warren Buffett, he's the founder of the real money team," Mayweather said, laughing. For all that's right in his world, though, Mayweather still has his problems. One of his friends turned adversaries recently mocked him, questioning his literacy. Rapper Curtis Jackson, known professionally as 50 Cent, pulled about as low class a move imaginable when he appeared to release a video in which he was about to take part in the ALS Ice Bucket Challenge. Instead, Jackson declined to pour the ice water on himself to raise money to find a cure for the horrific disease. He then offered to donate $750,000 to charity if Mayweather could prove he could read. Mayweather, who cleverly replied to the taunt, didn't make a public statement about Jackson's allegations. However, he has a strong suggestion of what 50 Cent can do with the money. "I was thinking of something, you know, when you asked me about 50 Cent. If you want to donate money, donate money to the Mike Brown family," Mayweather said. "I shouldn't stop you. Our company, me and Leonard [Ellerbee], we have been donating hundreds of thousands of dollars to different organizations for years without any media, without getting credit. … The best thing for 50 Cent to do, and there are no hard feelings, is to give that $750,000 to Mike Brown's family." It's a difficult world for minorities, and Mayweather knows that all too well. He sympathizes with the protesters in Ferguson, Mo., who are not only protesting the shooting of 18-year-old Michael Brown, but also of the circumstances of their lives. "It was a very, very bad situation, the Ferguson thing," said Mayweather, who'll meet Marcos Maidana in a rematch for the WBC welterweight and super welterweight titles at the MGM Grand Garden on Sept. 13. "I like to sit down and talk and communicate with my kids on a regular basis, about being fair, etiquette, honesty. Because as I was saying before, it's a very, very bad situation." Jackson's career has been fueled, in part, by creating conflict with other high-profile people. And this so-called challenge to Mayweather was just another attempt to create a conflict to keep his name in the news. Others couldn't resist piling on. A New York radio station put out what it claimed was a recording of Mayweather struggling to read. Sports talk hosts at stations around the country, as well as bloggers, picked it up and ran with it, laughing gleefully at Mayweather's apparent literacy problem. That is an indictment of their own character, clearly. Illiteracy is a serious problem in this country and what Jackson did by mocking Mayweather only made it harder for those who may look up to him to come forward and seek help for their own reading difficulties. Ellerbe, the CEO of Mayweather Promotions, said it wasn't worth responding to Jackson's claim. "If I would have done that, there would have been more stories written and more talk about that, and at the end of the day, for what?" Ellerbe said. "What do I have to defend that for? I know firsthand, as does anybody who has anything to do with our promotion, our business, that when it comes to reading, Floyd can read perfectly fine." Literacy is a serious issue in the African-American community and certainly not one to scoff about. According to the White House Social Statistics briefing room, literacy among blacks improved between 1992 and 2003, but illiteracy still is far too high. In 1992, 30 percent of blacks read at a below basic level. In 2003, that number fell to 24 percent. Only two percent in both 1992 and 2003 were rated proficient. Mayweather has four children – sons Koraun (14) and Zion (13) and daughters Iyanna (14) and Jirah (11) – and worries about the world they'll walk into when they are old enough to leave home. "I'm fortunate, because I happened to be on my own at 16 and I survived everything," Mayweather said. "My life was a roller-coaster ride, but I'm here, and I'm happy. I can't see my kids going out in the real world, not at 18. My son is not that far from 18. For my children, I don't want to see them leaving the home until they're at least 21." The odds of an impoverished person making it and becoming fabulously wealthy, like Mayweather has done, are overwhelming. Most, even those with superior athletic gifts, don't come close. Mayweather's children won't have to worry as much as their father, because all they've known is wealth and success. But he'll worry about them, because he knows how difficult it can be for a young black person in this country. Part of the reason for his amazing success is that he hasn't forgotten the difficulties of his early years. He lives in luxury, but he remembers the hard times just as much as he enjoys the good ones. As a wealthy man, he never really can be sure who his friends are because it's tough to know who likes him for him and who likes him because he's a rich celebrity. That wasn't an issue when he was young and poor and frequently on his own. And it's made him one of the best ever at his craft. He used his sorry past to fuel his success. Not many can do that, but not many are Floyd Mayweather, either.